The Grand Ole Opry started as the WSM Barn Dance in the new fifth-floor radio station studio of the National Life & Accident Insurance Company in downtown Nashville, Tennessee on November 28, 1925. On October 18, 1925, management began a program featuring "Dr. Humphrey Bate and his string quartet of old-time musicians." On November 2, WSM hired long-time announcer and program director George D. "Judge" Hay, an enterprising pioneer from the National Barn Dance program at WLS Radio in Chicago, who was also named the most popular radio announcer in America as a result of his radio work with both WLS in Chicago and WMC in Memphis. Hay launched the WSM Barn Dance with 77-year-old fiddler Uncle Jimmy Thompson on November 28, 1925, which is celebrated as the birth date of the Grand Ole Opry. Some of the bands regularly featured on the show during its early days included the Possum Hunters (with Dr. Humphrey Bate), the Fruit Jar Drinkers, the Crook Brothers, the Binkley Brothers' Dixie Clodhoppers, Uncle Dave Macon, Sid Harkreader, Deford Bailey, Fiddlin' Arthur Smith, and the Gully Jumpers. However, Judge Hay liked the Fruit Jar Drinkers and asked them to appear last on each show because he wanted to always close each segment with "red hot fiddle playing". They were the second band accepted on the "Barn Dance", with the Crook Brothers being the first. And when the Opry began having square dancers on the show, the Fruit Jar Drinkers always played for them. In 1926, Uncle Dave Macon, a Tennessee banjo player who had recorded several songs and toured the vaudeville circuit, became its first real star. The name Grand Ole Opry came about on December 10, 1927. 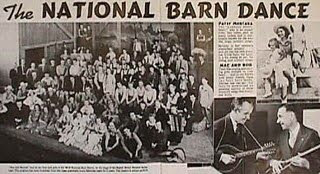 The Barn Dance followed NBC Radio Network's Music Appreciation Hour, which consisted of classical music and selections from the Grand Opera genre. Their final piece that night featured a musical interpretation of an onrushing railroad locomotive. In response to this Judge Hay quipped, "Friends, the program which just came to a close was devoted to the classics. Doctor Damrosch told us that there is no place in the classics for realism. However, from here on out for the next three hours, we will present nothing but realism. It will be down to earth for the 'earthy'." He then introduced the man he dubbed the Harmonica Wizard — DeFord Bailey who played his classic train song "The Pan American Blues". After Bailey's performance Hay commented, "For the past hour, we have been listening to music taken largely from Grand Opera. From now on we will present the 'Grand Ole Opry'". 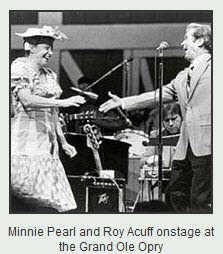 Top-charting country music acts performed there during the Ryman years, including Roy Acuff, called the King of Country Music, Red Foley, Hank Williams, Webb Pierce, Faron Young, Martha Carson, Lefty Frizzell, and many, many others. wonderful music and performances by everyone, thankyou for sharing.